Last edited by Lemo on 06-02-11 4:29 pm, edited 10 times in total. Hey, here is little script I did to run any midi with Synthesia in a random order. Basically, you just have to run it inside a folder with some midi files, and the script will choose one and play it with Synthesia. When the song ends, the game closes, the script chooses another file, and so on. and create neat shortcuts in your start menu. I decided to make it minimalist, so there is no track selection or score display, just a quick loop that uses your usual track settings. You can use F1(anytime) to close the script, or hit Esc while in Synthesia to stop or go to the next song. There is a few things you can change, and that's detailed in the text file. I included an .exe version if you wanna try without installing autohotkey (you won't be able to edit though). Here is the link to install Autohotkey, and the file is below. It would be nice to have a command line option to disable the "Synthesia is already running" message, and override the current midi by another one (in the same window). Also for some reason the file title is not displayed when launching a midi individually? Last edited by Lemo on 05-19-11 5:10 am, edited 1 time in total. This version loads a random midi from the Mutopia Project, and runs it with your default player for midi files. If you're using Winamp for example be sure not to allow multiple instances to make it work fine. Also you can check the webradio thread above to connect Winamp to a VSTi. The music will play for 30 seconds, then another random one is loaded from Mutopia to Winamp. You can change the length if you like, but I like it this way just for previews. Just like a webradio, each file is erased when the new one arrives, but if you like what you're listening to, you can save it with F2 to play it later with Synthesia. To close the script hit F1. I decided to switch from Mutopia to 8Notes, because their selection is probably better (well at least IMO). Mutopia apparently got a bunch of very old or unknown pieces for specialists, while 8Notes managed to find the ones that went through the centuries without sounding from another age. Or maybe it's just the way they set up their midis, I dunno. Also 8Notes tend to name their files with a more explicit name, which is quite handy when you don't know what you're gonna get. So what you get with this version is a random loader that get midi files from 8notes, and play them in Synthesia. I think they got a bunch a files there coz their id goes beyond 13000 or maybe more. 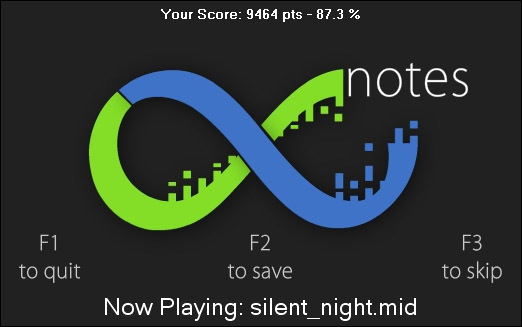 Just like the previous "player-oriented" version, you can save the current midi with F2, while the rest of the stream gets deleted as it flows. I still have some issues btw, because their website can display a midi link from php, even if the file is not there, so I got to run some checks that slow the thing a bit. Anyway I had some fun doing it. If by any chance I'm not the only one interested in this, I still got some ideas to improve the whole thing. But hey, you're also able to create podcasts in PalTalk if I'm right. If you want to create a webradio, isn't it a good idea to play 24/7 some music on a randomly generated podcast on Paltalk that comes out of your speakers, thru an awesome linked-to-Paltalk program? Lemo wrote: I think they got a bunch a files there coz their id goes beyond 13000 or maybe more. If PalTalk is a bit too simple, there is some more advanced way using WinAmp running from Nicholas' server, broadcasting live from a 'democrated-radioforum' (or something like that, so you don't need to sit infinitely long at the computer to set it all up again). If you want I can explain the whole process detailed and the source etc. and I suppose it's just the same for "PalTalk", or at some other server providers. Of course you can convert your midi to mp3s but that's not what I'm interested in. part of it, the user being at the center of multiple sources. While the other topic will be for the webradio, server-oriented, editorial kind of way. Last edited by Lemo on 05-10-11 5:36 pm, edited 1 time in total. When playing the random midi player, whenever there is a copy of one song then it finds another midi. How can I override this command? Where is the randomnotes getting the midis from? ( ) _ - , . and the other ones. DC64 wrote: When playing the random midi player, whenever there is a copy of one song then it finds another midi. Hum I'm not sure I understand , you're talking about the first version right? What is the command you want to override, the copy, or the switch to another song? You're talking about "RandomPlayWeb"(v2) maybe? DC64 wrote: Where is the randomnotes getting the midis from? The website is mentioned at least three times, my english is really that bad? As mentioned, it's a duplicate in the options, not in your files. When you make a copy it creates a "Copy of Song.mid", and with my previous code, Synthesia tried to load copy + of + song.mid. And why do you have to keep everything in double anyway o_O? Last edited by Lemo on 05-10-11 6:49 pm, edited 1 time in total. It was a bug that I did not like and it came up allot. Last edited by DC64 on 05-10-11 6:55 pm, edited 1 time in total. Just to point out, I like the software allot. Then why would you have MIDI support for that? Must people be able to 'decode' right from their computer? Never mind, I thaught you meant just creating a webradio like sound-only, but you want to send MIDI right? aria1121 wrote: Then why would you have MIDI support for that? Must people be able to 'decode' right from their computer? Well I suppose that any case, while the server would be running its own script, each user would also have to use a custom script or plugin to receive that. As soon as the software solution exists, it's just would be a matter of a few clicks for the end-user. 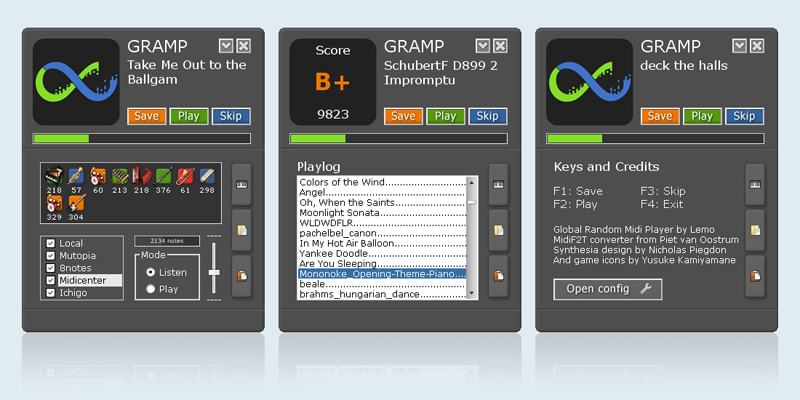 aria1121 wrote: Never mind, I thaught you meant just creating a webradio like sound-only, but you want to send MIDI right? Yeah no crazy sound format decoding. It would just be file-by-file "streaming" midi play. Btw. I use this technique to watch YouTube videos infinitely, like a TV. You press a hotkey, type in some keywords, and the results will be played one by one without any further interactions from your side. So it feels like a TV, but based on your keywords, kind of "custom TV" Of course you can switch to next video of the list if you do not like the current one. Also using cclive you can download the current video to your harddisk using another hotkey. Yeah, it would be a very good invention to have a "Random Channel"-button on your remote. There is a program called Minitube also (if you're too lazy to program it yourself :p), I used to let it run sometimes on my lil netbook. With google you can be sure to have infinite results to choose from !